The tri-foil is emblematic of the three parts of the Scout Promise. The middle portion points upwards and above the other two, signifying the lofty ideals of the Scout and the Movement. Through the middle of this mod-point is a line pointing upwards. This represents the Scout’s belief in God. The two side-portions of the Fleur-de-lys are equal and balanced, representing the fact that humanity is the same and everywhere equal. These two portions also stand for the balanced views of the Scout and his sense of equality and justic with regards to all things and people. 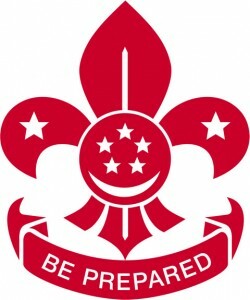 The two stars on either side represent the eyes of the Scout and through them he sees the stars’ ten points, representing the original ten parts of the Scout Laws which have been embodied into five. The three parts of the Promise are bound together by the circle containing the Crescent and the Five Stars which represent the state and the Nation,. The circle is the bond of brotherhood and it “ties” up to the Scout’s allegiance to his country and his desire to be a useful citizen.